Boil kazy separately in a pot. 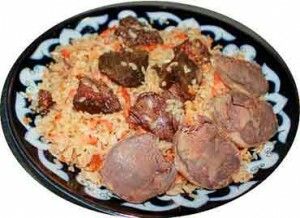 Follow remaining Kovurma Palov recipe from above, except add kazy instead of meat 20-25 minutes before adding rice. When ready, remove kazy and slice. Stir pilaff, serve in a mound on a large platter and top with slices of kazy.